I had absolutely know knowledge as to what Abigail's Party was but on further research I discovered its a play from the 1970's about a suburban party. So, in theory it should be good but this one just didn't do it for me. May 2015 was Alan Barnes month at Big Finish with his other story, Last of the Cybermen being released as part of the Locum Doctor's trilogy and Last uses humour to underline the tension, this one is laugh out loud funny but its not necessarily what Doctor Who should be. In fact, what I got from this one wasn't that it was a take on Abigail's Party, it seemed to me to be a crossover between Doctor Who/Witches of East End/Desperate Housewives, with strong female characters and hopeless husbands all with agendas of their own. 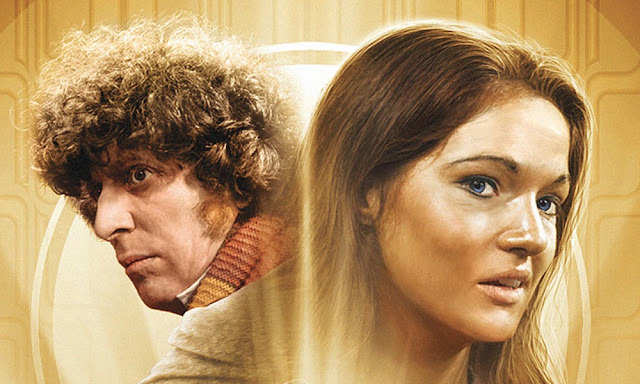 Its quite hard to pin point where this one goes wrong, the script is pretty decent with plenty of funny moments and the tension does build up as the story progresses, the acting, especially from Tom Baker and Louise Jameson is top notch and the direction keeps the story moving at moments when it feels like its come to a stand still. My theory is that its the music that just doesn't quite work for this one. Usually, the music, even for the rarely dire stories, is one of its saving graces but I don't think the music quite knows what its doing here. While the writing and acting is telling one story, the music is telling a completely different one and both are pulling tightly on a cord that threatens at any minute to snap and if that happens, the whole story could descend into chaos but while that doesn't happen, this story isn't one of the best this year, which is a great shame as I felt and still do feel, that this series of Fourth Doctor Adventures was so much better than last years releases. There is a great idea buried in here somewhere but its not pulled off successfully and I can't help but wish we had had something better than this. SUBURBAN HELL, WRITTEN BY ALAN BARNES AND STARRING TOM BAKER AND LOUISE JAMESON WAS RELEASED BY BIG FINISH PRODUCTIONS IN MAY 2015.